Ladies and gentlemen we are back for week 3 of the Lochdown! Sadly, I had to miss week 2 due to a wicked cold to the chest, and due to congestion still no voice version this week. 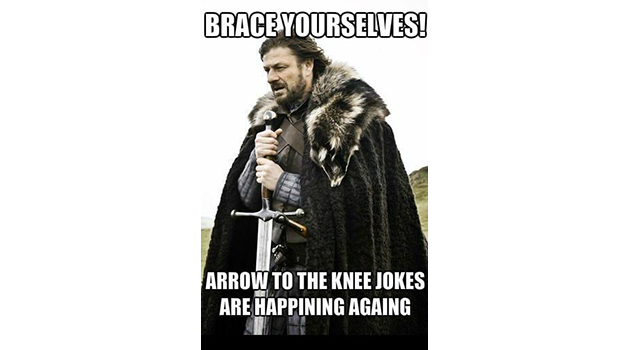 However unlike the NFL, I did not take an arrow to the knee. Old memes are the best, aren’t they? But at least now I am back and hacking away at the keyboard and feeding your football fanatacism for another week! Here’s to better health and saner sports! I could review week 2 as well as week three here, but one week 3 event seems to have eclipsed everything else more succinctly than Oprah’s in the way of the TV… which we will get to later. It started Thursday night as 2 teams who agreed to play no defense got into a shootout, with the Rams edging out the 49ers 41-39. Normally, I am not one for Thursday night games, and neither is the NFL. They only allow them as part of a DARPA experiment to see which uniform colors can actually drive people to blindness… or rage… or blind rage. Thursday night games are normally reserved for the 23 NFL fans who somehow get Friday off if their team is playing… but are otherwise teetotaler night at whichever stadium is playing host. This one was a rare exception and I almost regret missing it; but then I remembered it was the Rams vs the 49ers. The Lions, our kid brother who everyone picks on, lost a scorchingly close game to the powerhouse Falcons. It came down to a final drive wherein it appeared Golden Tate squeaked into the endzone with the last play of the game. Of course, every score is booth reviewed… and they reviewed this one over and over more times than the chorus from The Neverending Story’s theme song will now be repeating in your head. You’re welcome. In the end, the overturned the call of touchdown on the field, which should – in theory – mean they found conclusive evidence to overturn it. I’ve watched the replay in normal-speed, slow-motion, and frame-by-frame (while humming Neverending Story) and while it looks like it might be short… it’s hardly conclusive. The Lions getting picked on by the refs again? We’re sorry lil’ bros. The Jaguars kicked off their “home” game in London, Sunday… by taking a mass knee (no arrow required) to the national anthem. Then, in a fit of stupidity, standing for God Save the Queen. They played a game too, but their actions touched off a whirlwind of virtue signaling throughout the entire NFL. Since I gotta say it, I’ll say it once, and as clearly as I can. I don’t care if you want to protest. I don’t care what you want to protest. WHEN and WHERE you protest, however, is an issue. You are all millionaires, you can afford a snazzy infomercial. You are NFL players, if you call a press conference every media person in a 50 mile radius will attend. You are community figures, if you want to collect folks for a march or a bake sale or whatever to raise awareness or protest, you will certainly draw a crowd. On the other hand, if you bust into my bedroom at night and shout your opposition to economic policy, that’s an issue. If you crash little Barry’s bar mitzva and throw fake blood to oppose people eating meat, that’s an issue. If preacher says “If there are any objections to this union, state them now or forever hold your peace.” and you take that opportunity to rail about school choice, that’s an issue. There are appropriate times and places for protests. During a ceremony (that is mandated in the NFL manual of game conduct by-the-way) that honors our country and symbolizes it via the flag and the anthem… protesting “police injustice” is very inappropriate. It’s lame. It politicizes sports. It saps the energy and willingness of fans to watch. It’s been going on long enough that apparently everyone but you, the kneelers, understands what it really is… tawdry virtue signaling. Stop it. Just stop. You have 9,000 more ways to reach people constructively than 99% of people in this country do. You have multiple platforms. Stop crapping on the 2 platforms that we enjoy to get away from political stuff – sports and the flag/anthem. Well pick that shoe back up, Scooter! The Vikes thundered back into the W column with a dominant 34-17 shellacking of the Buccaneers who had just, in turn, embarrassed the Bears the week before who in turn beat the Steelers who had previously smashed us. Parity makes weekly power rankings about as accurate as a Ray Charles – Stevie Wonder dart game. Case Keenum channeled the spirits of quarterbacks past to set new personal one-game records with 369 passes, 3 touchdowns and no sacks or interceptions. His main target was Can-You-Diggs-it who racked up 173 yards and 2 touchdowns, and also Hooked-On-a-Thielen for another 98 yards to lead the receiving corps. Combine that with Dalvin Cook racking up 169 total yards, 97 of which were rushing and you have the makings of a monster offensive game the likes of which it feels like we have been craving since the Battle of Hastings. Defensively, while we only had 2 sacks, we pressured Winston regularly and forced 3 interceptions to Sendejo, Waynes and Smith. While Winston did have 316 yards passing and 2 TDs, it had little effect as the Bucs running game was absolutely stuffed, racking up a total of 26 yards all afternoon. In all, while the Vikes defense was not abusive to the Bucs, it quickly established control of the game and made them 1-dimensional, yielding opportunities like pull tabs at a strip joint. The best part of the game, however, was the official Vikefans.com tailgate. Seeing the wonderful people from this board (despite wandering around the wrong side of the stadium almost until kickoff), sharing some beers and utterly fantastic barbecue, and generally enjoying the company of some of the best people I know made even a big Vikings win even better. Thank you to everyone for making it happen. You are a special crew. Since I don’t have any Lochdowns for week 3, I can only count week 2… in which I went 3-0! Yep, I’m back at it but as soon as any of you look to me for betting advice, it’ll ruin that quicker than the wife discovering your dirty magazine collection and special sock. Let’s hope my streak continues! First up – The Steelers are gonna rebound harder than mom after meeting dad’s new girlfriend. Both they and the Ravens suffered a humiliating loss last week, but the Ravens will rebound like the fat kid at the park basketball court. It’s not going to be pretty, and most likely won’t be fun either. Next up – The Eagles will avail themselves of a home-crowd advantage, even though they are playing at the Charger stadium. Let’s face it, the Chargers at the moment are attracting about as many fans as a piano recital for the deaf, while their team is firing on about 2.5 cylinders. They are a boring team playing boring games, and their fans are outnumbered about 12-1 on any given Sunday in their own stadium. People in Philadelphia will be almost the only people watching this game, and get to see an Eagles win. The Upset Special! – There are a few juicy ones to potentially choose this week, but I am going to go with the Rams upsetting the Cowboys. The Rams have been scoring faster than rabbits on meth, while the Cowboys have been busy being inconsistent. I don’t think the Cowboys defense has an answer for the Rams offense, or at least not as much as an answer as the Rams defense has for the Cowboys offense. Or if the offense has a defensive answer to an offensive defense. Football is hard. Rams win in an upset. The Lions meow their way into US Bank Stadium on Sunday for a NFC North showdown that will carry all the brawling division rivalry a person can stomach before realizing it was bad chicken wings. The Lions have the highest paid player in NFL history in Matthew Stafford and… not a whole lot else on offense. Yes they can score, but the offense flows through Stafford and is dependent on him staying upright and making his reads and throws. Their running game is spotty at best, and so should be shut down early by the Vikings defense. Should that happen, expect Hunter and Griffen to be licking their chops like a starving dog at a butcher’s convention. As for the Vikings offense, we do not know if Bradpool will be back, but it is unlikely for this week, giving Keenum another chance to reach for the stars. That said, with the emergence of the Diggs-Thielen-Feelin, the Detroit secondary will be hard pressed to cover them as well as support the run against Dalvin Cook. Their hope resides in the Detroit defensive line, which could pose a threat to the Viking offensive line. This game will come down to offensive vs. defensive lines. Whichever team wins in the trenches, that team will come away the victor. I have a feeling the Vikings offensive line will manage to do enough, while the defensive line puts Stafford back in the hurt locker for a while and shuts their offense down. Make no mistake, the game will be hard fought, but will be won by the Vikings 24-13. On that note, until next week – SKOL my bandits!